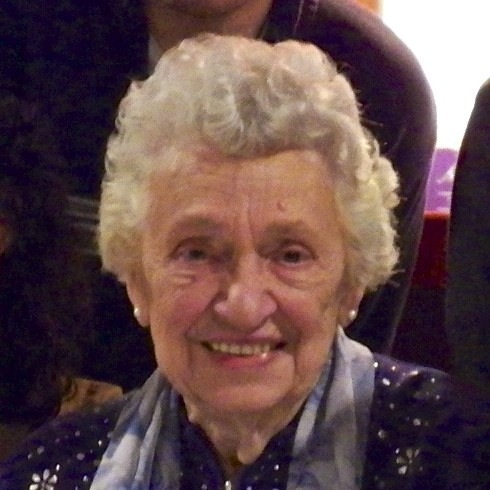 As was mentioned yesterday, today is the 90th anniversary of my Zia’s birth! Last Saturday, some 2 dozen Bartolini gathered at the home of one of her Grandsons for a surprise party in her honor. (Very heavy emphasis on the “surprise.”) The food was delish; the champagne chilled and plentiful (just how I like it); and the highlight of the evening was her Son’s slide show of family photographs. It was a wonderful night for this very special Lady and Matriarch of the Bartolini Clan. She deserves no less! Yesterday, I recounted my favorite story involving my Zia as a means of celebrating her birthday. What’s this? You missed it? Well, click HERE to view yesterday’s post. Once there, you’ll see how Zia and Pope John Paul II are connected. Don’t worry, we’ll wait for your return. When we left our story, Zia and I had just experienced a close encounter of the Papal Kind and were in a taxi being ferried back to our hotel. When we arrived at the hotel, we skipped lunch, preferring to retire to our rooms. We had anticipated a memorable day and this was so much more than that, a truly once-in-a-lifetime experience. A rest was definitely in order — if for no other reason than to allow Zia to re-hydrate. Later that afternoon, as was our custom, room service delivered our caffè to Zia’s room. Normally, this is when we would have planned our dinner and evening. That night, however, we decided to “stay close to home” and made an early reservation at a restaurant just down the street from where we were staying. Not that much later, we were seated at the restaurant, our appetites still nowhere to be found. Now, one thing you should know about my Cara Zia is that she loves pasta every bit as much as I do. When we dined, we always enjoyed a primo piatto of pasta of some sort before ordering our secondi and contorni. So, absent an appetite, we did what came naturally: we ordered pasta. Not so coincidentally, that pasta just happens to be today’s recipe, Spaghetti alla Carbonara. Mom first prepared this dish for me when I was in my teens. She told me a legend that its name was derived from the coal miners that worked in the mines that surround Rome. As they ate their lunch, which often consisted of a plate of pasta, coal dust fell from their clothes and on to their plates. The dish’s ample use of black pepper is an homage, of sorts, to those miners and their lunches. The version Mom served me usually contained bacon, although prosciutto was sometimes substituted, albeit rarely. Pancetta just wasn’t something that Mom and Zia used in their cooking. 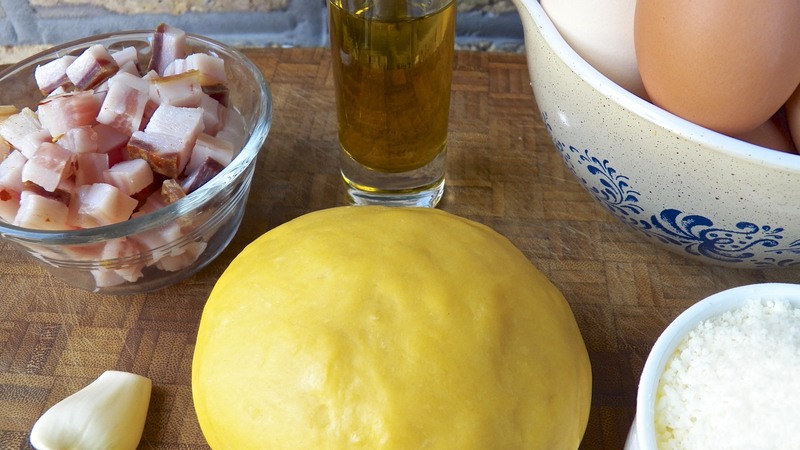 Remember, many of the Bartolini dishes began with a battuto of onion, garlic, parsley, and salt pork. There was no need for pancetta, too. As my experience as a cook grew, however, I began to use pancetta more frequently when I prepared this pasta. Back in Rome, Zia and I noticed that this pasta was made with guanciale, something that was an unknown to me. Our waiter explained that guanciale comes from the pig’s jowls and, like pancetta, it’s cured but not smoked. Although now used throughout Italy, our waiter went on to explain that it is still most commonly used in Rome and its surrounding district of Lazio. Well, we needed no further urging. Zia and I ordered the Spaghetti alla Carbonara and so began my love affair with this cured meat. Unfortunately, it would take me 10 years to find a source for guanciale in my hometown but that’s a story for another day. Even so, in my mind, Spaghetti alla Carbonara will be forever linked to Zia and Pope John-Paul II. OK. So far I’ve explained the connection between Zia and the Pope and how, on the day of their meeting, we dined on today’s pasta, Spaghetti alla Carbonara. Get ready, kids. Here comes Santa Claus! No, that reindog isn’t Max. In the years following that momentous day in St Peter’s Square, I’ve prepared Spaghetti alla Carbonara countless times. It is one of the few dishes I prepare using spaghetti because it’s just not my favorite form of pasta. 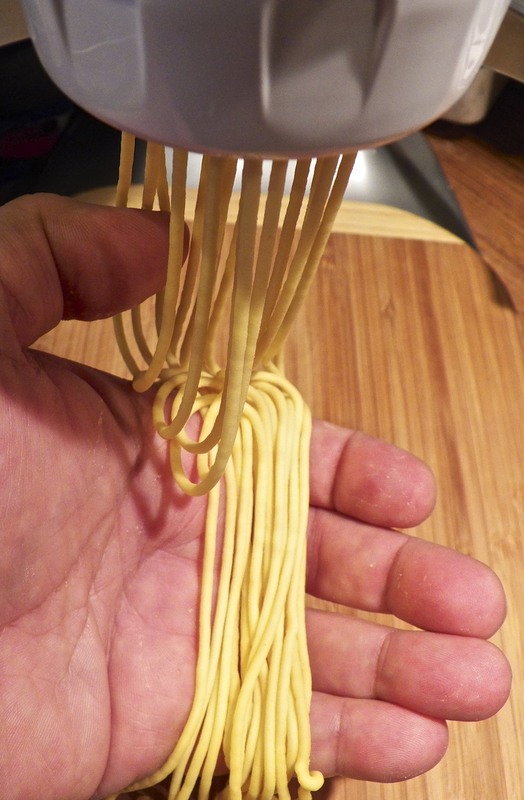 You see, lacking the means to create this thin, round-shaped pasta, I had to rely on manufactured spaghetti. As you know, I prefer homemade pasta over pretty much all manufactured types. Still, when it came to this tasty dish, I gladly bought spaghetti and never thought twice about it. This all changed 3 years ago, almost to the day. Warm a large pasta serving bowl. Bring a large pot of heavily salted water to boil. Add the spaghetti and stir. Check the spaghetti package’s cooking instructions. You’ll want it to be 2 minutes shy of al dente when the rest of the ingredients are ready. Add half of the cheese to the 3 eggs and beat well to be rid of any lumps. In a large, deep frying pan, heat the oil over medium heat. Add the pancetta and brown, rendering all the fat. Do not over cook. Add the garlic and sauté for about a minute. While the garlic cooks, reserve a cup of pasta water, drain the pasta, and add the pasta to the frying pan. Continue cooking the pasta in the oil for 2 minutes, heating it thoroughly. Pour the frying pan’s contents into the warmed serving bowl. Add the egg and cheese mixture in a slow, steady stream, stirring constantly to prevent the eggs from scrambling. Once fully coated, add more cheese, the pepper, and as much pasta water as necessary to create a creamy sauce. Serve immediately with plenty of grated cheese and cracked black pepper available at the table. For so few ingredients, this is a relative tricky dish to prepare. If not done properly, the pasta will not be hot enough to cook the eggs, raising the possibility of salmonella. To eliminate that risk, I only use pasteurized eggs when making this dish. On the other end of the spectrum, it is very easy to “scramble” the eggs rather than create a sauce. You can limit this risk by mixing the pasta and egg mixture off the heat, in a warmed bowl, and/or by adding a little of the hot pasta water to the egg mixture before it’s added to the pasta. This will, in effect, temper the eggs a bit. No matter how you do it, remember to keep the pasta hot and to work fast. 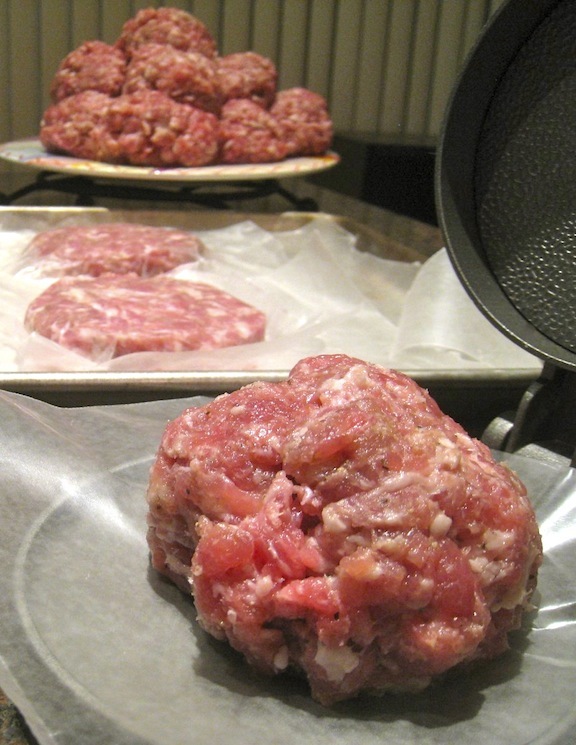 It was just about a year ago when I shared the Bartolini recipe for making sausage. Mild compared to most spicy sausages, ours depend upon garlic, white wine, and salt & pepper for flavoring. Consider them a platform on which to build your own sausage. Paprika, red pepper flakes and fennel seeds will change them up a bit, as will marjoram, mint, and oregano. Though these days we tend to form patties more often than sausages, the post is nonetheless chock full of sausage making information. Feel free to ask any questions that may arise. You can view the post by clicking HERE. This entry was posted in Family Recipes, Pasta/Rice/Soups (Primi Piatti), Personal and tagged Cooking, family recipes, Food, Italian, Pasta, Recipes by ChgoJohn. Bookmark the permalink. The reward for being unable to sleep? Finding your post in my email. What a lovely photo of your beautiful dear Zia. The celebration sounds perfect. Sipping chilled champagne in her honor- Cheers! Thank you, Ruth. I’m answering comments rather than sleeping. I hope you’ve gone to bed by now. Thanks, Charlie. Doesn’t Zia look wonderful? 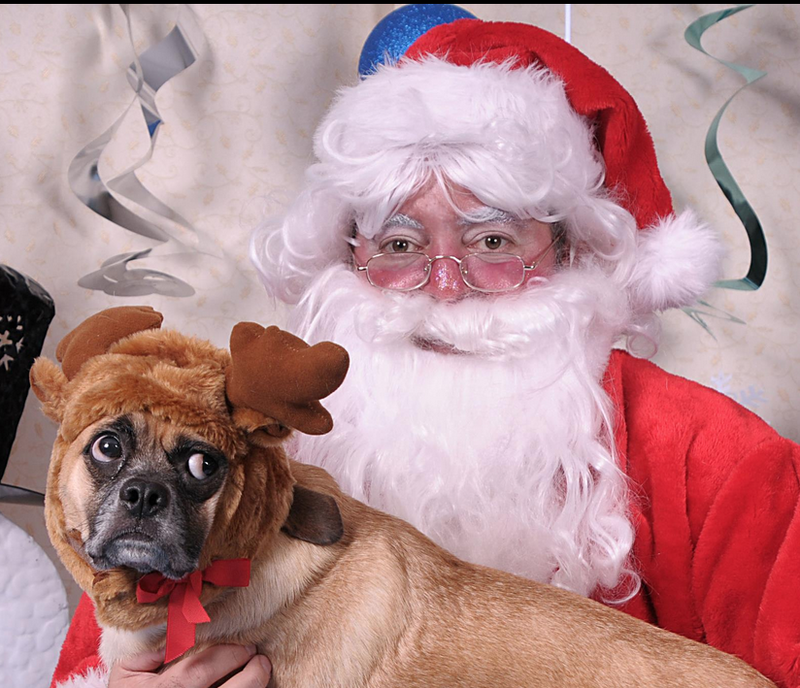 I’ve a number of pics of my friend playing Santa for a canine rescue charity but this one, with that poor reindog, was my favorite. Poor things looks mortified! Zia wouldn’t mind one bit if you added cream to your carbonara. That’s the thing about Italian cooking. It is nowhere near as precise as some other cuisines. Mom & Zia were Sisters and we lived in the same 2-flat. They made the same dishes but each was a tad different. If you like cream in your carbonara, add cream to your carbonara. Buon appetito! I love your little teasers at the end of each post John, keeping us eagerly waiting on what’s to come. Sadly my pasta machine only makes “square” spaghetti – strangely not one I make very often. I loved reading about how the story all came together – such a lovely read. I love Carbonara, and usually make it with pancetta because guanciale is hard to find in these parts. I make it without garlic but with white wine — I’ll try your version next time. It looks great! I like your idea of adding a bit of wine to this pasta. i’ll be sure to give your recipe a try, too. Your post gave me a craving for carbonara, and luckily I had some pancetta in my refrigerator so I made it that very same night, with garlic this time. Came out great, also because of the great pecorino sardo I used. I know carbonara is from Lazio and should thus be eaten with pecorino romano, but the only romano we can get here is mainly very salty. The sardo has so much more taste! Same here, that’s one of the reasons why I cook so much Italian food. We simply love pasta and eat it at least 4 times a week (and then often risotto once a week as well). Thanks, Roger. I’m glad you enjoyed both. Great story and delicious pasta, as always – I love carbonara. I’ve heard of guanciale before but never tried it. Maybe I can find something similar here in the Boqueria Barcelona, otherwise, it’s a good excuse to wander round Italian delis in London. Thanks, MD. I’ll be speaking with Zia later today and I’m sure she’s going to enjoy reading all of these birthday wishes. Now that I’ve a good source for guanciale, I keep some on-hand. You just never know when the urge for carbonara will strike. Looks delicious! And I love the video. Why doesn’t this happen at malls more often? This really has been a brilliant series of posts. You had me hooked–i couldn’t wait to find out the final connection with Santa. What amazing stories! Happy Birthday to Zia! Thank you so much. Now you know why this is my favorite “Zia story.” How could it not be? Zia will love reading all of these birthday wishes. Thanks! You make spaghetti too? Is there anything you don’t make??? That’s a mighty gracious (or hungry) elf! Perfect story ending. B E L I E V E ! Thank you so much, Maria. Zia will be very happy to read all of these birthday messages. I can’t wait to talk with her later today. I can’t believe she is 90!! Great for her! I loooove carbonara! You made me hungry! Thank you, Villy. Zia is a very active 90, too. In fact, sometimes I think she’s more active than I am. That was one awesome trip! Great storytelling there, John 🙂 Happy 90th to Zia. This is actually one of the very few pastas I will make from scratch, thanks to my Kitchenaid pasta attachment. 🙂 Looks wonderful and now I need to see if I can find some guanciale. Happy 90th to your Zia and may she live in good health to be a centenarian. That attachment is something isn’t it? Santa was very kind to me that year. Carbonara is one great pasta dish, to be sure, and I’m lucky to now have a steady supply of guanciale. Even so, the dish is still very good with pancetta. Zia is going to be thrilled reading all of these birthday messages. Thank you! Give Max my apology for mistaking the reindog for him last week – my bad. Carbonara is a great recipe, isn’t it? Now that I’ve a source for guanciale, I make it far more regularly than I ever did. Don’t worry about Max. He only looks at the blog’s pictures and never reads any of the captions. It would interfere with his nap time. Awesome! While a few “others” were reading your previous post I was crying over the “spontaneous” aria! Wiping my tears, I got on with the rest of your wonderful tale. John, really a spectacular post! Loved that you pointed out that the perfect food to eat when one has no appetite is a delicious bowlful of pasta! 🙂 And looking at that extruded spaghetti in your hand, it looks quite obvious, but to be sure I’m wanting to ask: what do you think of the attachment? I’ve wondered for a couple years about it. I know no one better to trust on the subject. Thanks so much for such an entertaining read John!! And buon compleanno, Zia Lea! Thank you so much, Spree, for you kind words and birthday wishes. Wasn’t that aria fantastic? How I would love to witness a flashmob like that! I chose that clip because Zia and I saw a performance of the arias from La Traviata while in Rome. It wasn’t the full production but very enjoyable, nevertheless. The attachment makes perfect spaghetti, no doubt about it. The other pastas are a bit thicker than store-bought. It really is a matter of personal taste as to whether you like them more. Although I prefer my pastas thinner, freshly made pasta is so much tastier than store-bought. What a fun post, John! I loved every bit of it from the gorgeous picture of Zia (she looks fantastic) to the history of carbonara (I had no idea the pepper was the carbon), to the amazing Flashmob Aria and the story of your Friend/Elf…quite a generous one I’d say! It made me smile and delighted me through and through. I’m so happy that you and Zia shared such a great trip, and that the family had such a fun time and lovely party to commemorate her 90th. My husband’s fave pasta is carbonara, so maybe I’ll make your recipe for him soon. 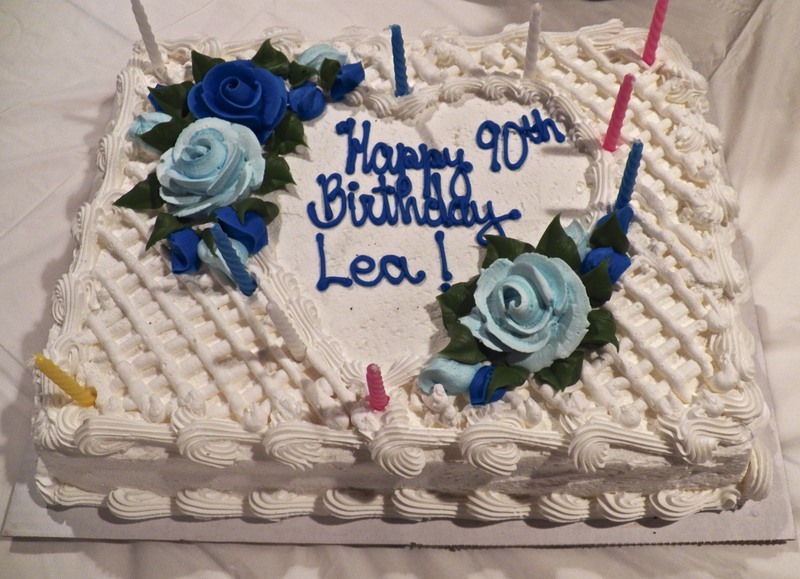 So I guess I have to be the one to ask this: why does the cake say Lea instead of Zia? Thank you, Betsy, for leaving such a nice comment. Zia does look good, doesn’t she? She positively glowed at her party last weekend. It was a great way to celebrate her birthday and a complete surprise. She certainly didn’t expect to see me there. We had talked the day before and she had no idea. Your Brother and his gift gave me a good chuckle. Say what you will, he certainly was honest. 🙂 I hope you still have that cookbook. It’s priceless. Happy birthday to Zia! And thanks for explaining the origin of the name of spaghetti alla carbonara, a dish which I’ve always enjoyed making (I can buy pancetta but I’ve never seen guanciale). AND look at that spaghetti making machine – what a treasure! I love spaghetti but have never made it. Now I want a spaghetti attachment for my pasta maker! Thank you so much. I know she’s reading these comments and is thrilled at how kind everyone has been. I have to laugh at all of the pasta making equipment that I own. I’m just spoiled, I guess. If I can make a favorite pasta by hand, I will. It always tastes better! She is lovely and grand. I’m sure she was thrilled with the surprise party! The recipe is the icing on the cake to a fantastic story John. How fortunate you are to still have her! Best wishes on her Birthday! Thanks, David, for you comment and birthday wishes. Zia will be pleased when she read them, that’s for sure. You all have been so kind and I very much appreciate it. 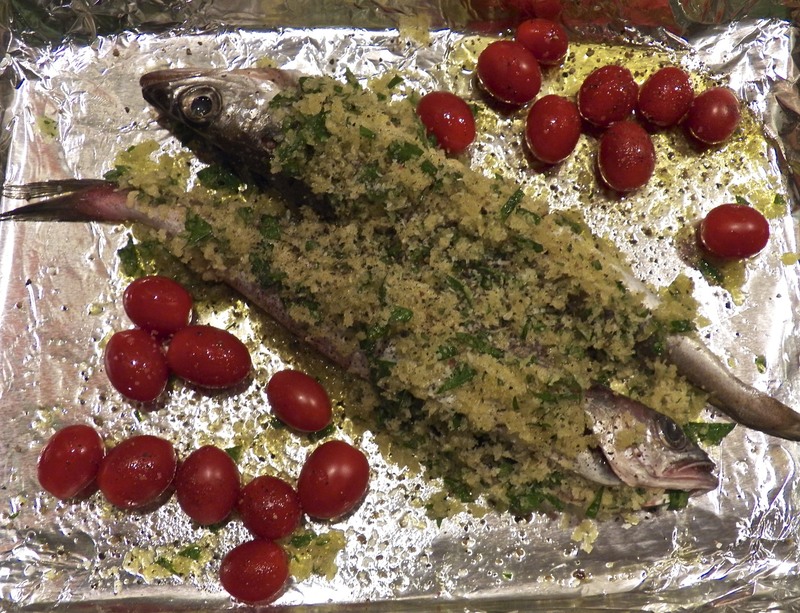 Can’t wait to see your next post Merluzz’ al Forno: I love that fish! Thank you so much, Marina. As you know, your name has significance in my family and Zia will surely smile when she reads your gracious comments. Santa was good to me that year. As for the attachment’s performance, the spaghetti is the best ever. The other noodles are a bit thicker than are store-bought. The bucatini, for example, is about twice as thick as normal. The rigatoni is too, for that matter. As I told another commenter, I need to try using a pasta dough made with just durham flour and water, as opposed to Mom’s recipe of eggs and AP flour. That may make a difference. Before you buy the attachment, let me try it and get back to you. It is not a problem to do so. I love making pasta! You’re so welcome, Marina, and Zia will love geting the “hug”. Thanks on her behalf. I loved reading every word of your post John! Wow, Sawsan! What a lovely thing to say. Thank you very much. And yes, Zia looks wonderful and glowed all night at her party. It was a great night! Such a delicious story! I had guancialle on my first visit to Siena and indeed, it’s a special thing! Hope Zia enjoyed her day! Thanks you, Sally. Having had guanciale, you can well imagine my delight when I finally found some here in Chicago. I’ve not gone without since and have 2 pieces in my refrigerator right now. Just to be clear, this pasta maker is an attachment and not an extruder machine. (I had one of those and did not like it at all.) They work very similarly, though. I think the real difference is that the attachment is manufactured by a more reputable company. Yes, ZIa has had a wonderful birthday, Aside from Saturday’s party, friends took her to lunch yesterday & today, and tomorrow they’re going out to dinner. What a birthday! Well you’ve just solved the daily mystery of what I’m going to make for dinner tonight – thank you! I’ve got a little bit of leftover ham so that should do fine although I really like bacon in there. Zia is an absolutely stunning woman. May she have many more wonderful birthdays. Oh – and if that Santa needs my address, I’ll be happy to provide it. Thanks, I’m sure Zia will be pleased to read your compliments. Carbonara is such a great pasta. I hope you enjoy it as much as we do. Just thought I’d get back to you – the Carbonara was a super hit last night (after a week full of absolute bombs for one reason or another). It was just perfect! Thank you, Michelle. I have that book! Another blogging buddy used a recipe from it to make duck prosciutto last Winter. I was going to make some but our weather got so warm last Spring that I had no place to cure the breasts. Obviously, I’d not read the entire book and didn’t know about the guanciale recipe. The real goal now will be to find the hog jowls. They’re just not something one finds around here. I’ve a neighborhood butcher — the last of a vanishing breed — and will ask if he can order them. Thank you so much for the info and idea! What a story! I see why it’s your favorite Zia story, John; it is truly good for the soul. This is gonna stick with me for a long time. It makes me smile. And at a time of year when I search for smiles. Thank you SO much for sharing all of this. It just makes me feel good. 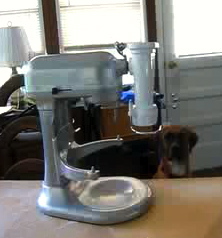 Is that a Kitchen Aid Professional 5 plus mixer? I have the same one and need to find that attachment Santa brought you, stat! In the meantime, I’ll use a packaged spaghetti (gasp!) for the Carbonara. I hope mine looks as good as yours does. Wow. Thanks for sharing all of this John 🙂 Hugs! Yes, that’s my KitchenAid. As you can see, Max loves to see it out and ready for use. He’s aways at the ready for a scrap of fallen pasta. 😉 I hear ya on the flashmob! LOL!! Hubby found the pasta attachment for us in Madison today. I didn’t realize they fit all the KA mixers, but nevertheless, YAY! Max….he’s such a good boy, and pasta connoisseur 🙂 Gotta love the guy! Happy birthday Zia! Gorgeous lady! I love the entire post. Of course now I am very hungry for Spaghetti alla Carbonara, sausage, and a slice of birthday cake. And that upcoming Merluzz al Forno is looking pretty good too! Maybe Santa Claus will surprise me with all these delicious dishes!!! Thanks, Judy, for Zia’s birthday wishes and this great comment! Another great post! Your friend is truly a good one — what a thoughtful gift! (Yeah, yeah, it was from Santa.) I know all about guanciale but very rarely use it — it’s available if I drive a distance to buy it which just isn’t that convenient, so I always end up using pancetta. Otherwise my Spaghetti alla Carbonara is pretty similar to yours. And we used to have an extrusion pasta machine, but never really liked the texture of the finished pasta (plus it was such a pain to clean). So I always buy dried spaghetti. Should I be asking my own Santa for that mixer attachment? 😉 Another really fun post — thanks so much. Thanks, John, and, yes, he is a good friend. Isn’t carbonara a great dish? Having a convenient source of guanciale is such a treat but pancetta is a great substitute, too. Yum yum yum. Great story, great recipe, and a great smile on your Zia’s face. Thank you! Zia positively glowed all night at her party. She was thrilled. I believe I forgot to wish your dear Zia a very, very happy birthday yesterday: I happen to have a 97-year old gentleman living opposite and a 93-year old catty-corner and, yes, Zia looks wonderful . . . I believe not only genes but knowing how to enjoy life play a huge part . . . But, as an addendum – since I have been an absolute opera freak since age six [not telling fibs!!] I SO enjoyed the flashmob performance . . . thanks again and keep on celebrating right thru’ Yule! Thank you so much. Zia will be thrilled to read all of these birthday greetings. I spoke with her this evening and the partying continues. Her friends have been taking her to lunches and there’s dinner later tonight. Come Sunday, after Mass — she’s in the choir, you know! — I think she’ll be ready to hang up her party shoes and have a good rest. It’s been quite a week! I, too, loved that flashmob performance. My Dad was a huge opera fan. He told tales of being a young boy and sneaking into the village theatre to watch opera performed. It was his town’s only entertainment. It’s a regret that I didn’t “discover” opera until after he was gone. I could have learned so much from him. Yesterday is a ‘cancelled cheque’: enjoy it now 😉 ! Your Dad was lucky, so was I: it may be escapism in a way, but what a composite joy!! Thank you, EllaDee. As I’ve mentioned, Zia is really going to love reading all of these birthday wishes. You all have been very kind. Every time that mixer is out and every time I grab my pasta making equipment, Max comes around. He may not be in all of the photos but, trust me, he is always there. He is an opportunist like no other. Should a piece of pasta fall, he’ll catch it in mid-air. Should I turn my back on the pasta board, he’ll vacuum up as much as he can in that limited amount of time. He is something else! I am glad that you enjoyed this post. It was a joy to write. How wonderful!! A birthday and Santa’s elf.. and a wonderful memorable dish to serve it all up!! I think this food ( and your love ) are big reasons for Zia’s incredible health and beauty for her age.. it’s really very impressive. I’ve read about guanciale somewhere in blogging land and now must look for it.. it seems so much richer than bacon ever could be. I’ve really loved these two posts, the linking of stories.. and how you kept us waiting from one post to the next! How kind is a friend who hears a wish and makes it come true.. you are so blessed to have such wonderful family and friends! Zia was radiant the night of her party. Well, once she got over the shock of seeing us all. She really wasn’t expecting a party that night. It pleased her no end. What I like most about pancetta and guanciale is that neither is smoked, unlike our bacon. You taste the cured pork, as a result, and not the smoke. Granted, there are times I want the smoke flavoring but not always, like in a carbonara. Thank you, Debra! You really should try your carbonara recipe but with pancetta instead. It will replace the smoky flavoring with that of cured pork. Of course, if you can find guanciale, by all means use it, but it’s not that easy to find. Thanks BAM for Zia’s birthday wishes and comment. I’d love to return to Italy. Having been there a few times, I only met the Pope when Zia was with me. She must be some incredible good luck charm. Who knows who we’ll meet this next time? Thanks, Celi, that’s very kind of you to say. Trying to get the raw eggs to both cook and coat the pasta can be tricky. It’s one of those times when an extra set of hands sure would ccme in handy. Mixing the cheese into the eggs and really blending them, is the key, I think. I have never, before or since, seen eyes as blue as the Pope’s that day. Zia will tell you the very same thing. They were gasp-worthy. I’m sure it was the sudden burst of sunlight & his pallor that contributed to the effect. They were, nevertheless, unlike all others. By the way, Zia’s birthday is the 29th. We need to get you on that plane and home-bound, Celi! You’ve got too many things to keep track of right now. Board that jet, get a glass of wine, and relax — probably for the first time in weeks, I’d imagine. You, too, have a great weekend. I hope it will be as warm as they’re predicting, YAY!!! Your Zia (Lea) is beautiful and so elegant! Was she surprised or she had guessed something was going on behind her back? How wonderful you could all get together for this very special Lady and Matriarch of the Bartolini Clan. Lovely that you have such a special relationship with her. Bet you are her favorite nephew. Thank you, Norma. Zia is going to love reading all of these comments. Being that my family reads these comments, I really can’t say I’m her favorite. Thank you, Susie. Funny thing. As a boy, I can remember wishing we had our own home, one with less than half as many people. Now, however, I realize just how special that two-flat was and how really fortunate we all were. I so hope you make it to Italy. You will absolutely love it! I would go back in a heartbeat if I won any sort of lottery. No doubt about it. Wouldn’t it be wonderful to see air travel return to the way it was just 10 years ago? Today’s high-cost, no frills approach to air travel is sucking all the joy out of taking a trip. By the way, I won $4.00 in last Wednesday’s drawing. That will pay the subway fare to the airport. I’m getting closer! What an amazing post! So glad I popped over here to catch up! I remember eating pasta with guanciale in Italy, too. It took me almost a year to find a butcher here in Brooklyn that sold it, but damn it’s good! You found it after a year? It took me 10 years to find guanciale but I’m so glad I did! I’m glad you came back and liked this post. Thanks for taking the time to comment. Happy, happy birthday to your lovely Zia from this Canadian follower ‘next door’ in Ontario! It has been such a pleasure to get to know her through your posts, and I wish her many more years of happiness and good Italian food! Your Spaghetti alla Carbonara sounds so good; I haven’t had this particular pasta dish yet, but you recipe will help me remedy that! This is a great dish of pasta, Mar. Just remember to beat the eggs and cheese together to prevent clumping and to work fast. You’ll see why so many of our fellow bloggers love this dish. Wow, she looks absolutely amazing! Happy 90th Birthday to Zia! Thank you for stopping by to send her birthday wishes. She’s gonna love this! Wow, a belated happy birthday to Zia. What a great post and a beautiful pasta. Thanks, Greg, and I apologize for missing your comment. I’m sure Zia didn’t though. She’s thrilled to see so many birthday wishes. You all made her birthday even more special. Bella Zia! So very youthful looking! I can see the sparkle in her eyes!! Watching my figure aside, I’ve always thought carbonara was the ultimate in comfort food. As a teenager, this was the dish I was drawn too while my girlfriends hit the ice cream, I whipped up a HUGE bowl of carbonara! My mom too didn’t have pancetta always on hand and used bacon. I could eat this for breakfast…and I have.. it does have eggs and bacon!!! Oh, Linda. I love the way you think. Carbonara: the perfect breakfast food! You wouldn’t get a complaint from either Zia or me and, frankly, I’m surprised we didn’t think of it. When I visit her, we have pasta just about every day — unless risotto is being served. It was a wonderful party for her last weekend. She positively glowed all night, as that picture shows. Thanks for leaving such nice comments and compliments. She’ll be pleased to read them. I just watched the whole flash mob video…wonderful! Those things always make me smile. Such a great way to spread joy. Pasta looks wonderful too, btw. I’m thinking it would be a good New Year’s Eve dish. What I wouldn’t give to witness a flashmob like that! A real thing of beauty to witness. Thanks for dropping by and taking the time to comment. Great story John, to go along with one of my favorite pasta dishes. Thank you, Karen. I’m glad that you enjoyed them both. Happy birthday Zia!!!! (Abliet a few days late.) Please send our wishes for a fantastic year! Well, this is some really great news, Kristy, especially the part about your Sous Chefs liking it. Ya just can’t get much better than 901 spoons. 🙂 And I really am honored to read that you’d even consider, much less make, this carbonara on Christmas Eve. Thank you for taking the time to ‘report back’ and I’ll be sure to pass along your thanks to Zia. She’ll be thrilled. I don’t know what makes me hungrier- the lovely sight of that guanciale, or the nest of fresh spaghetti. This post is a feast! Loving the Verdi flash mob…much better then a Batman premiere shooting. In Spanish there is a saying, “segundas partes nunca fueron buenas” (Sequels are never any good) but it doesn’t apply here at all. This post is the perfect finale. John – Such a lovely story (which I read while I listened to Verdi). I’m thrilled to see your Carbonara recipe. I can’t wait to make it. I love Carbonara but find it is one of those dishes that has to be made perfectly to be at its best (there is nothing worse than a Carbonara made with a heavy, cheesy béchamel). I know from your other recipes that this one will meet my lofty standards. Also, I first ran into guanciale when cooking at Vie. It isn’t pretty to look at, but it is delicious! This is the first time I’ve seen it in a recipe since then. P.S. Happy birthday to Zia! Thank you so much for the compliments and birthday wishes for my Zia. Everyone has been so nice. For me, the key to a good carbonara is to make sure the eggs and cheese are very well mixed. If they appear lumpy, I’ll add a bit of the hot pasta water just before adding the egg mixture to the pasta. The hot water will smooth the mixture’s consistency and it will coat the pasta so much easier. John – I LOVED this post. It was just like sitting down and having a wonderful chat with you. Accompanied by an excellent bottle of red wine, of course! Your photos are just beautiful ! I consider myself very lucky because, when we lived in Malta, we were close enough to Rome and Venice etc. to be able to visit several times. 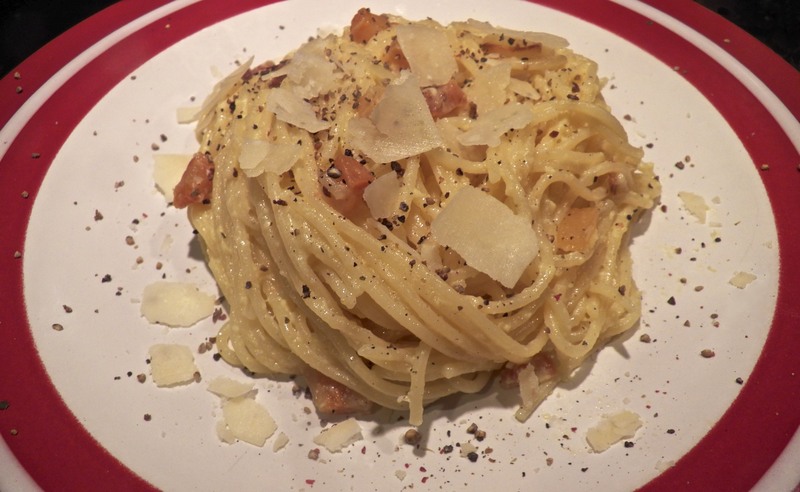 I really enjoyed your stories and I love the recipe for Spaghetti alla Carbonara. I make it occasionnaly – and love it – but I’ve had a problem with the eggs ended up a bit like scramble eggs. Thank you so much for your tip on how to avoid that!! So glad you enjoyed the post, Cecile. It is definitely one of my all-time favorite experience with Zia and one we talk about all of the time. It was such a treat being there when the Pope held her hand. Neither of us will ever forget it. I never made it to Malta and hope to do so one day. I have been to Italy, though, several times and hope to get back there sooner rather than later. For such a simple dish, Carbonara sure can be tricky. Tempering the eggs with a bit of pasta water really does help to cut the likelihood of scrambled eggs. I hope you it works for you, too. Love this post. I had friends over for dinner Saturday night and had to share with them this lovely and beautiful memory of yours. Cheers and blessings to all. Thank you so much for you kind words. This is definitely my favorite “Zia Story,” one that we talk about all of the time. I’m truly glad that you liked this post enough to share it with your friends. My Zia will be, too, when I tell her. Thank you again. You are so welcome and it is fantastic that you and Zia were able to have such a beautiful experience together. All my best to you and your beloved Zia. Happy Belated Birthday to your wonderful Zia !! What wonderful memories you two have made together. I make Spaghetti Carbonara every once in a while. I don’t know why I don’t make it more often – cause I LOVE it!! From now on, I’m going to use your authentic recipe. And thanks so much for the tips on how to avoid ending up with slightly scrambled eggs!! Thank you so much, Cecile, Yes, we have shared some wonderful times and meeting the Pope is definitely a high point. Isn’t a carbonara a great meal? I think you’ll find that tempering the eggs with a bit of the hot pasta water will not only prevent the dreaded scrambled eggs but will result is a nice little sauce when combined with the pasta. It really works!